Fully adjustable dog harness. Steel nickel-plated buckles and rings. 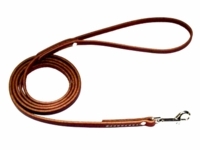 Durable 2-Ply Latigo leather. Neck: Measure around the dogs neck. Chest: About 4 to 5 inches behind the front legs measure all the way around the dogs body. Chest Strap adjusts 26 to 34 inches. 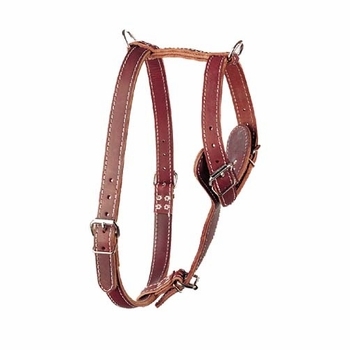 Neck Strap adjusts 14 to 22 inches. Chest Strap adjusts 35 to 42 inches. Neck Strap adjusts 17 to 24 inches.